List of contributors. Preface. The Otto Loewi Lecture. Loewi's discovery and the XXI century. Section I. Neurobiology of Cholinergic Transmission. 1. Molecular properties and cellular distribution of cholinergic synaptic proteins. 2. Redistribution of clathrin and synaptophysin at the frog neuromuscular junction triggered by nerve stimulation: immunocytochemical studies of vesicle trafficking. 3. Transcriptional regulation of the human choline acetyltransferase gene. 4. Biosynthesis and integration of acetylcholinesterase in the cholinergic synapse. Section II. Vesicular Acetylcholine Transporter. 5. The VAChT/ChAT "cholinergic gene locus": new aspects of genetic and vesicular regulation of cholinergic function. 6. Expression of the vesicular acetylcholine transporter in mammalian cells. 7. Interactions of protons with the acetylcholine transporter of synaptic vesicles. Section III. Neuronal Nicotinic Receptors. 8. Nicotinic receptors of the vertebrate CNS: introductory remarks. 9. Nicotinic acetylcholine receptors on hippocampal neurons: cell compartment specific expression and modulatory control of channel activity. 10. Structure and function of neuronal nicotinic acetylcholine receptors. Section IV. Muscarinic Receptors: 1. Structural aspects. 11. 3-Heteroarylquinuclidin-2-ene derivatives as muscarinic antagonists: synthesis, structure-activity relationships and molecular modelling. 12. Allosteric regulation of muscarinic receptors. 13. Molecular aspects of muscarinic receptor assembly and function. Section V. Muscarinic Receptors: 2. Mechanisms of Desensitization. 14. Regulation of muscarinic acetylcholine receptor expression and function. 15. The role of G-protein coupled receptor kinases in the regulation of muscarinic cholinergic receptors. 16. Activation, cellular redistribution and enhanced degradation of the G proteins Gq and G11 by endogenously expressed and transfected phospholipase C-coupled muscarinic m1 acetylcholine receptors. Section VI. Muscarinic Receptors: 3. Coupling to intracellular signalling pathways. 17. Muscarinic receptors and cell signalling. 18. Muscarinic receptor activated Ca2+ channels in non-excitable cells. 19. Muscarinic activation of phosphatidylcholine hydrolysis. 20. Participation of small GTP-binding proteins in m3 muscarinic acetylcholine receptor signalling to phospholipase D and C. Section VII. Presynaptic Modulation of Acetylcholine Release. 21. Modulation of acetylcholine release by nitric oxide. 22. Presynaptic interactions between acetylcholine and glycine in the human brain. 23. Purinergic regulation of acetylcholine release. 24. Activity-related modulation of cholinergic transmission. Section VIII. Cholinergic Dysfunction: 1. Animal models. 25. Immunolesion by 192IgG-saporin of rat basal forebrain cholinergic system: a useful tool to produce cortical cholinergic dysfunction. 26. Cholinergic drug resistance and impaired spatial learning in transgenic mice overexpressing human brain acetylcholinesterase. 27. Amyloid &Bgr;-peptides injection into the cholinergic nuclei: morphological, neurochemical and behavioral effects. Section IX. Cholinergic Dysfunction: 2. Mechanisms in dementia. 28. The systems-level organization of cholinergic innervation in the human cerebral cortex and its alterations in Alzheimer's disease. 29. Cholinomimetic treatment of Alzheimer's disease. 30. New trends in cholinergic therapy for Alzheimer disease: nicotinic agonists or cholinesterase inhibitors? Section X. Cholinergic Dysfunction: 3. Trophic Factors. 31. Neurotrophic factors. 32. Development, survival and regeneration of rat cholinergic septohippocampal neurons: in vivo and in vitro studies. 33. Effects of trophic factors on the CNS cholinergic phenotype. 34. Synaptic modulation by neurotrophic factors. 35. Neurotrophic factors for experimental treatment of motoneuron disease. Subject index. 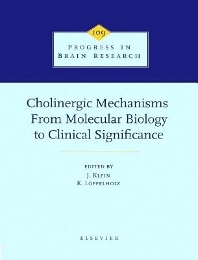 This volume offers a comprehensive update and overview of the field of cholinergic transmission as presented by some thirty distinguished investigators who were recruited for their task from Germany, Great Britain, Canada, USA, Sweden, Israel, France and Italy. Exciting new discoveries, described in this volume, are due to recent methodological breakthroughs. These discoveries throw new light on many areas of cholinergic mechanisms.